Summertime, no doubt. 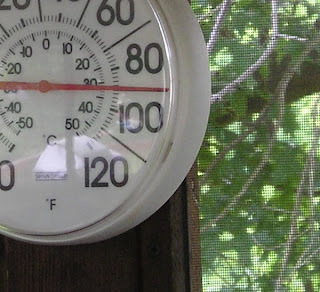 This is the temperature on the screened in porch under a shady tree. After the daygown, I wanted something quick to work on. 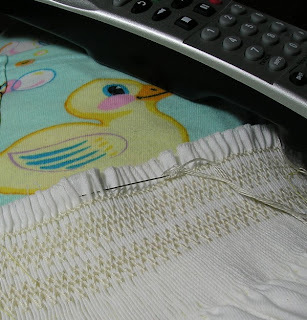 So I am smocking a basic yoke in a simple design. Perhaps an entry for the state fair. We will see. I have never smocked on winter twill before. It has great body, the pleats stand up nice and hold their shape. I got this kit from Country Bumpkin while they were having a sale. I didn't want to do any prep work. It is summer time after all, I just wanted to pick up the needle and stitch. So that is what I am doing today. So what could be better on a lazy summer afternoon when you don't have to be anywhere or do anything? Not a lot really. So here are the elements of my afternoon, the TV remote for watching movies, my rubber duck pj's (refer back to not go anywhere or do anything comment) and my pleated skirt front. The only thing not pictured is a cold drink and perhaps some chocolate. Have to be careful on the white though. It is only a size 6 months so it may only take two movies to finish the smocking. My spirit needed quick and easy! I hope you have something relaxing to do on this hot summer afternoon. Perhaps if a shower blows through and cools things off I will move to the screened in porch. 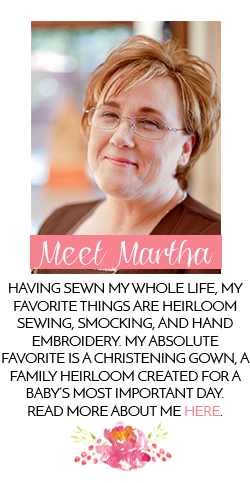 Martha...sounds like a lovely way to spend the day!!! It was! And do you know that gown is almost finished smocking. I think I have 2 more rows on one sleeve. Amazing how quick everything else goes when you have spent so long on one project. I spent my Sunday morning and afternoon doing some serious smocking as well. 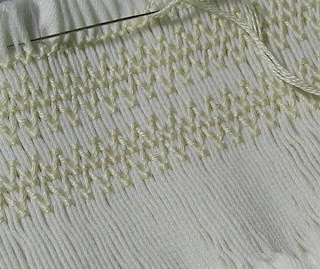 Your smocking is lovely and I can't wait to see the completed gown. Thanks, the smocking is done and I am doing bullion roses now. It is gratifying to finish something quickly.